"Get the a pyephem object representing a earth satellite at a particular date, given a TLE file describing the orbit"
The problem is that there are large jumps in the CXBN.elevation, and this causes jumps in the components of r_eci. I am starting to look into the SGP4 code you are using, but this I don't yet understand why this is happening. Is this a problem with the code's treatment of the orbit around the point of perigee? Lance — I apologize that you have been waiting! Yes — I, the author of PyEphem, am indeed watching this website. The email alerting me about your bug is, in fact, marked "important" in my incoming email folder. But not until I have given my talks this weekend at PyOhio will I be able to dig into the math of the satellite function, and try to figure out what is causing your discontinuity. I will let you know what I find — and thanks for your interest in PyEphem! Brandon, I apologize. I did not realize it was just you maintaining this package. 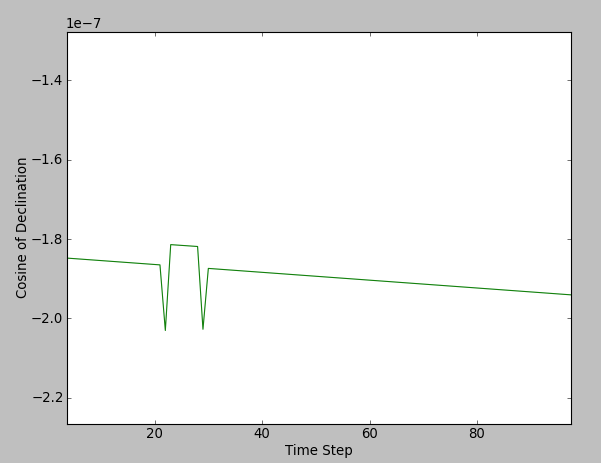 I have been trying to figure out where in the code the error is coming from, but I still don't have a firm conclusion. I appreciate what you're doing with PyEphem. It's a really wonderful tool. I am now happily ensconced at PyOhio and have spare cycles to check out your issue! I have not yet been able to reproduce your problem after a few tries, however. First, your code does not run when pasted into a Python file — for one thing, the statement "EpDate = float(EpDate)" is trying to access the "EpDate" before assigning it a value for the first time. Another problem is that your code has many symbols that are never defined — but two friendly fluid dynamics engineers at the table suggested that they looked like NumPy names ("double", "arange"), so maybe I am missing some import statements from the top of your program? 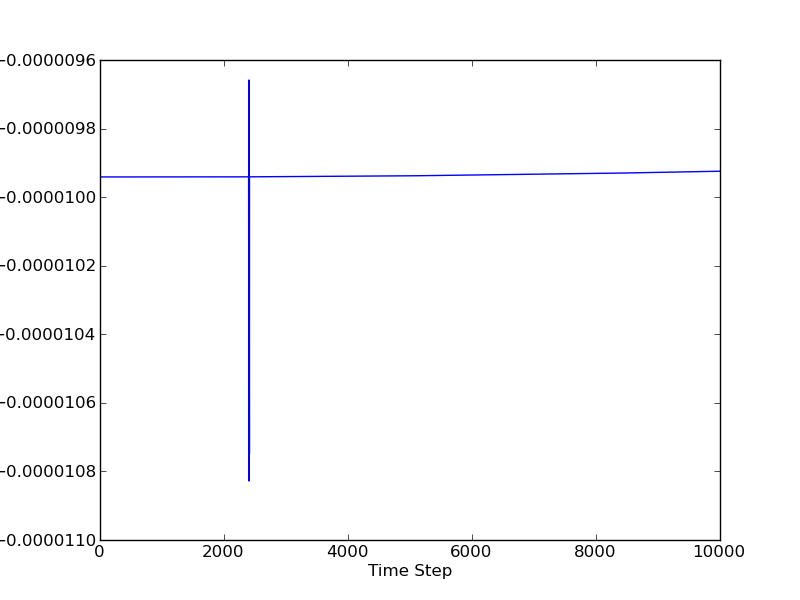 Finally, the numbers I got out looked nothing like yours; could it be that the transitions you are making to and from NumPy floats are losing some precision somewhere? Anyway, to move forward I think I'll need your full .py file; making random changes to what you pasted above in an effort to produce working code is not producing anything like your graph. I'll keep watching this issue this evening and tomorrow, and start up the investigation again if I see you attach a file. I am sorry for posting an incomplete script. Not only did I forget to include all my import statements; I forgot to do things as critical as initializing EpDate! In the code that I was running, EpDate was indeed initialized, so that's not the problem. I have created a bare-bones script that includes a minimal amount of packages to show the error. Assuming you have matplotlib, you should be able to plot the RA and DEC difference arrays and see the large jumps like the ones shown in the plots I have attached. If not, you will have to comment these statements out. I've included the script as an attachment. 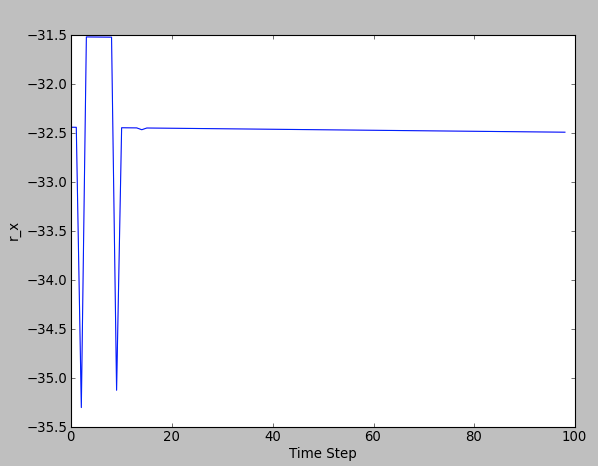 You can see the only thing I've done is convert the ra and dec using the float() statement. But this is something that is done in the PyEphem examples, so I'm guessing this is not the problem...unless it's the way the Mac processor treats floats, but I can't imagine that would be the case. I looked through the C source code, and I see how there could be a problem around 200km where the orbit is evaluated using different terms, but my orbit is nowhere near that altitude. So I'm still a bit puzzled. 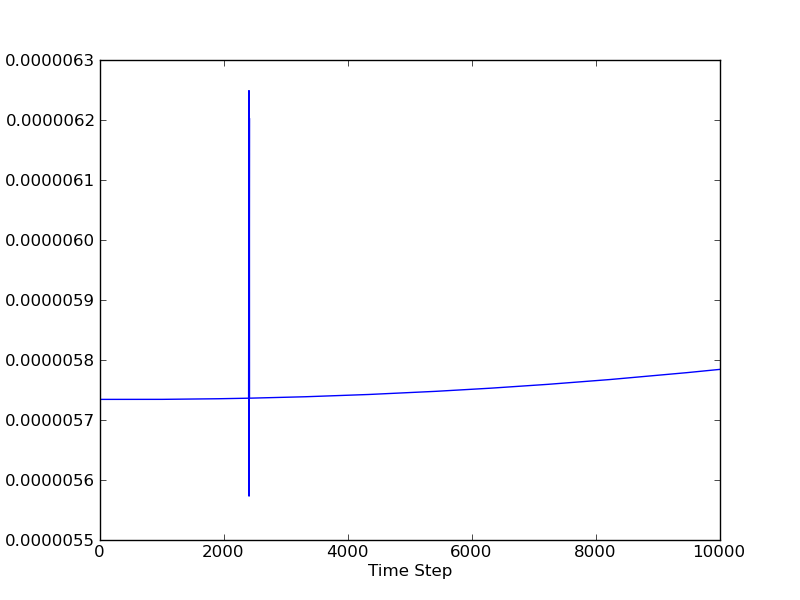 Note that I also run this out of the pyraf environment, so pyraf works interactively with matplotlib. I'm not sure if the plots will behave nicely from the command line, but I imagine you have your own way of plotting arrays. The script raised the exception "TypeError: range() integer end argument expected, got float." but then I threw an int() call into the expression "Times = range(int(NumTimes))" and the script ran! (I commented out the "print" statement since it was otherwise taking forever to run and actually draw the graphs.) So I can now indeed see the continuity problem on my own screen, and will drill in and see if I can find its cause. Thanks for packing the script in an executable form for me! And this is the source of your problem: the region which you are exploring is one in which the loop usually does 2 iterations, but on occasion is happy enough with its first answer, and ends after only 1 iteration. And this causes your discontinuities: you are seeing the difference between where 1 iteration puts the answer and the more refined value that 2 iterations produces. I think this will make the discontinuity small enough that you will no longer be bothered by it. If so, let me know, and I'll make that change to my copy to. But if not, then please experiment with even smaller values for E6A until you are happy with the result, and let me know what you wind up with. Thanks! able to compile it on my own. I will let you know once I have done so. > refined value that 2 iterations produces. > you wind up with. Thanks! The suggestion you made helps out quite a bit. It's removed the major kinks that I showed in the previous plot. There is still one discontinuity near apogee, even with E6A=1.E-14. I have to make sure this is due to a jump in RA or DEC, though. I would say that setting E6A to 1.E-12 is a good start for now. I will let you know if lowering the value further helps get rid of this last kink. Apropos #11, that's probably down to a change in Python 2.7. Up until 2.6, if you passed a float to a function that was defined as taking an int, the float would automatically be converted, though possibly with a DeprecationWarnng. In 2.7 (and Python 3000) it's now a TypeError. So, you have to put in an explicit conversion to int wherever this occurs. There are quite a lot of packages affected by this! The increased e-12 precision will be part of PyEphem 3.7.5.1, which I am releasing this evening. Enjoy!